To register, please print, complete and return this RESERVATION FORM. For more information, contact Cindy Boyer at cboyer@landmarksociety.org and 585.546.7029 x12. In September we will enjoy the “highs” and “lows” in this two-part trip to the southeast part of our state. We’ll journey to the Hudson Valley, staying in the storied village of Tarrytown, visiting some truly spectacular homes. After indulging in architectural grandeur and fine Hudson Valley cuisine, we’ll spend the last part of our trip at Mohonk Mountain Resort. En route to the Hudson Valley we’ll visit Olana, a State Historic Site, the home and studio of eminent Hudson River School painter Frederic Edwin Church. It’s a unique mixture of Victorian architectural elements and Middle-Eastern decorative motifs, inspired by the artist’s trips to Europe and the Middle East. You’ll just know it’s a feast for the senses, and truly unlike any other house in New York State – or America, for that matter. Our home for two nights will be The Tarrytown House Estates. In the heart of “Sleepy Hollow Country,” Tarrytown House Estate has long been a cornerstone of the historic Hudson Valley of New York. First as a country home for affluent families of the tobacco and railroad industries from the mid 1800’s through after the turn of the century, the Estate is where the wealthy hosted countless galas and events. In 1964, founder Bob Schwartz, the New York Bureau Chief with Life Magazine, revolutionized the executive training and meetings industry with the creation of Tarrytown House – the nation’s first commercial conference center, with the addition of guest room wings and meeting spaces. We’ll stay in the comfortable guest wings and dine in the Tarrytown House. In the Hudson Valley, we explore the two biggest influences on this part of the world: Washington Irving and The Rockefellers. 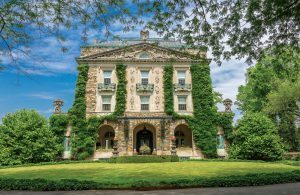 Experience both with visits to Washington Irving’s Sunnyside, a charming home on the banks of the Hudson, and two sites influenced by the Rockefellers. Sunnyside will give insight to the creator of the Headless Horseman in “”The Legend of Sleepy Hollow” and Rip Van Winkle. We’ll experience one more Tarrytown wonder. Wander along a woodland path and enter the year 1750, when Philipsburg Manor was a thriving milling and trading complex that was home to 23 enslaved individuals of African descent. A National Historic Landmark, this picturesque site will have you reaching for your cameras – and the tour will reach your heart, as it brings to life the stories of the 23 skilled enslaved people who spoke several languages, ran the international shipping operations for the Philipse family, and maintained the mill and dairy. 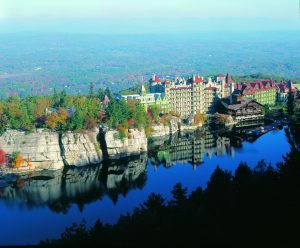 Our final night will be up in the mountains, at Mohonk Mountain Resort. You’ll think we’ve magically transported you to the Swiss Alps. This Victorian castle resort and spa has many activities, gourmet dining, invigorating trails, and relaxing lodge sitting rooms and library. 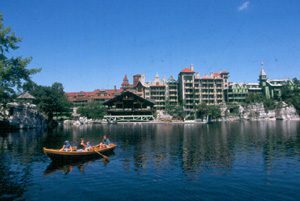 The last time I took a group to Mohonk, the guests threatened to mutiny and refuse to leave the site!